Why get a security company to install CCTV when an electrician can do it cheaper? We all want our homes to be secure but we have to balance the cost of providing that security with the potential loss of a break in. CCTV may seem excessive on a domestic property but it can be an appropriate precaution for those with high value homes/contents/vehicles, those in a high risk area or those who have been the victim of a break in or anti-social behaviour previously. There are 2 main considerations to balance when it comes to choosing a CCTV system – the cost of the system and the functionality of it; how well it works. One way of keeping the cost down is to engage an electrician, rather than a security firm, to install an entry level system. This will perform a basic job and the existence of the cameras will act as deterrent to some would-be intruders but while you’re gaining in cost savings, you’re losing something in functionality. An electrician will be able to do a perfectly adequate job in installing the system and wiring it up. Unfortunately that is where their expertise and knowledge ends. The difference you get from a security engineer is their experience of maximising the value from that system. Even with like for like equipment you will get so much more from a system that has been installed by a security engineer because of the way it is specified and set up. An electrician fits CCTV, a security engineer designs it. We start the process by understanding how you want the system to work. Instead of asking ‘where you want the cameras?’, we would ask ‘what do you want to see?’. We know about the things to avoid that can compromise the system such as the effects of direct or indirect sunlight. We know how to set the system up correctly and adjust the settings to get the most from it and create a unique system for your property. The end result is that you get the most out of it including the areas and angles covered by cameras, the quality of the images and consistency of performance in different weather conditions and lighting levels. 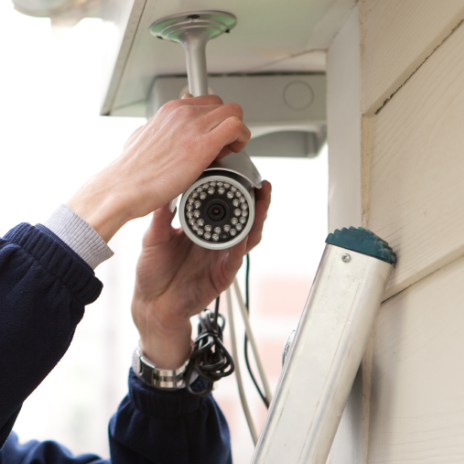 We can also integrate the CCTV with your intruder alarm system. Each trade has their own areas of expertise. Electricians are highly skilled people but they don’t have the security knowledge that we do. Just as we wouldn’t attempt to re-wire your house, electricians simply don’t have the particular skills to get the most from a CCTV system. Not only that but we have all the industry specific accreditations you need from a security provider (which may also be required by your insurance company). It all depends on what you’re looking for. You will usually pay a little more for a security engineer than you would an electrician so if it’s cheap and cheerful you’re looking for then that may be an option for you. However if you do have high value possessions, live in a high risk area or have been unlucky enough to have been the victim of a break in already then it might pay to do the job properly. Unfortunately the test usually only comes in the event of an intrusion and that’s not the time to find that the system was not fit for purpose. For a limited time only we are offering over 15% off our domestic CCTV systems for our existing customers. This represents a saving of £150! See our offer for full details here. This offer is only valid until 31st May 2014.